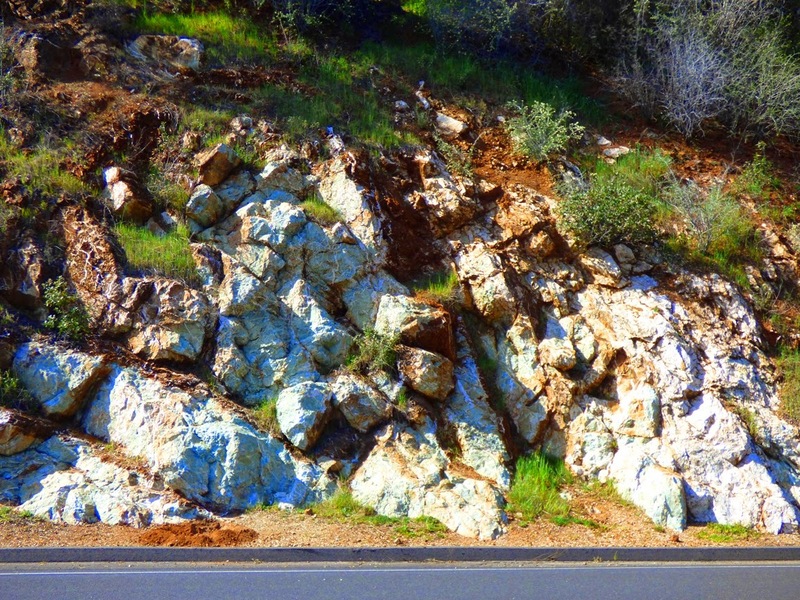 In a recent post, I explored the geology of the Charlie Brown outcrop. It included excellent examples of normal faults, welded tuff, and airfall tuff, features that served as a microcosm of the geology of the entire province. I was on a field trip this weekend and saw another famous roadcut that encapsulates the geology of a different region. It was the Coulterville exposure of the Mother Lode quartz veins. It can be seen a few hundred feet west of the main junction in the village on Highway 132. 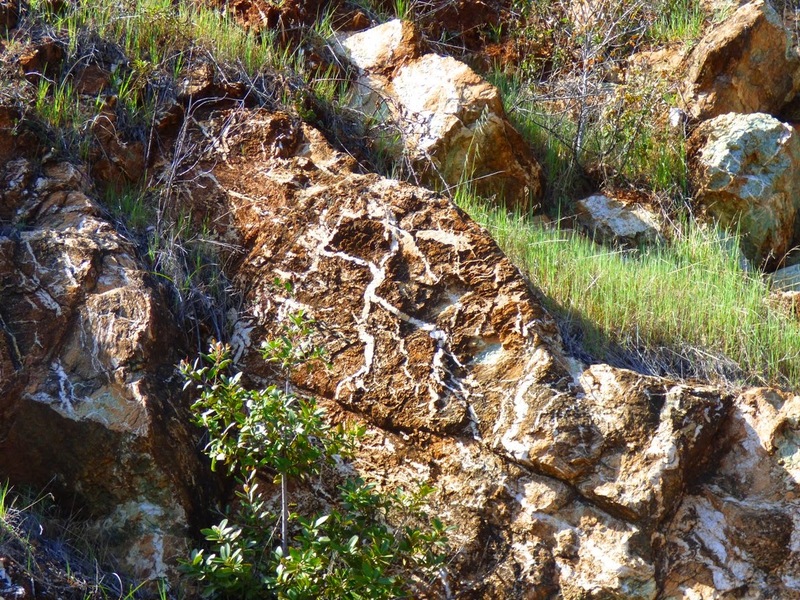 Despite extending for more than a hundred miles through the western Sierra Nevada foothills, the quartz veins of the Mother Lode are surprisingly hard to see in detail. 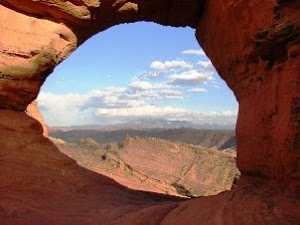 In many places the rock has simply been removed by mining. In other instances the veins are on private property and are not accessible. But in Coulterville, the full extent of the minerals and faults of the Mother Lode are wonderfully exposed. During the Jurassic Period, a vast subduction zone formed the margin of the western edge of the North American continent. Oceanic crust was being driven downward into the mantle, where parts of it melted to form granitic intrusions. 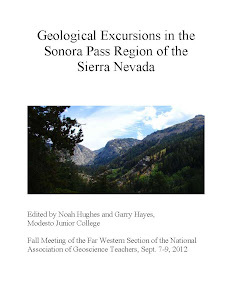 In the Cretaceous, the focus of subduction moved west to where the Coast Ranges are today. The old subduction zone provided an avenue for mineralized solutions to rise towards the surface, where they precipitated quartz and metal deposits including gold and copper. The Melones fault was part of this system of fractures, and runs from Mariposa to Sierra City. Much of the Gold Rush gold was found in the vicinity of this fault zone. Highway 49 follows closely along the trace of the fault as well. The outcrop at Coulterville is the boundary between two terranes, bits of crust that were carried across the Pacific and added to the edge of the continent. 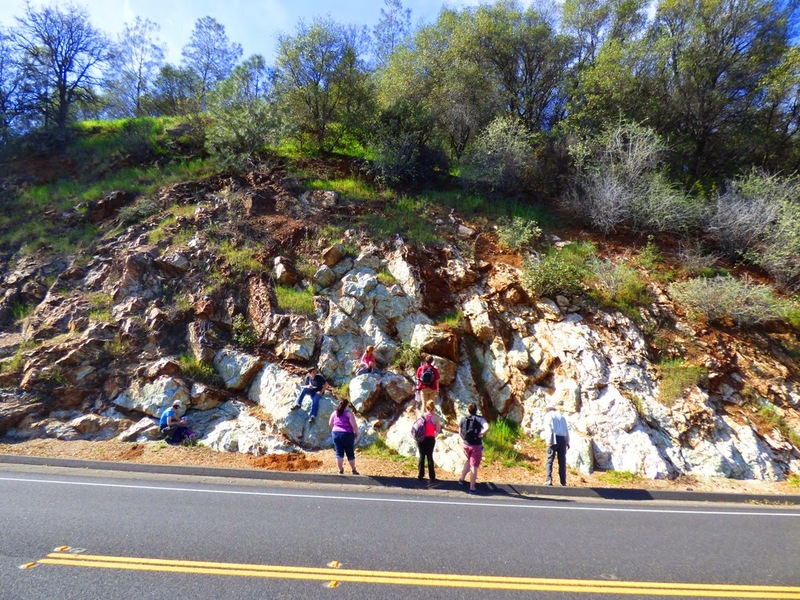 The Calaveras Complex lies east of the fault, and the Foothills Terrane is found to the west. The fault zone exposes quartz veins, pyrite, and a unique mineral assemblage of quartz, ankerite, and mariposite. The ankerite is an iron-magnesium carbonate mineral similar to dolomite. 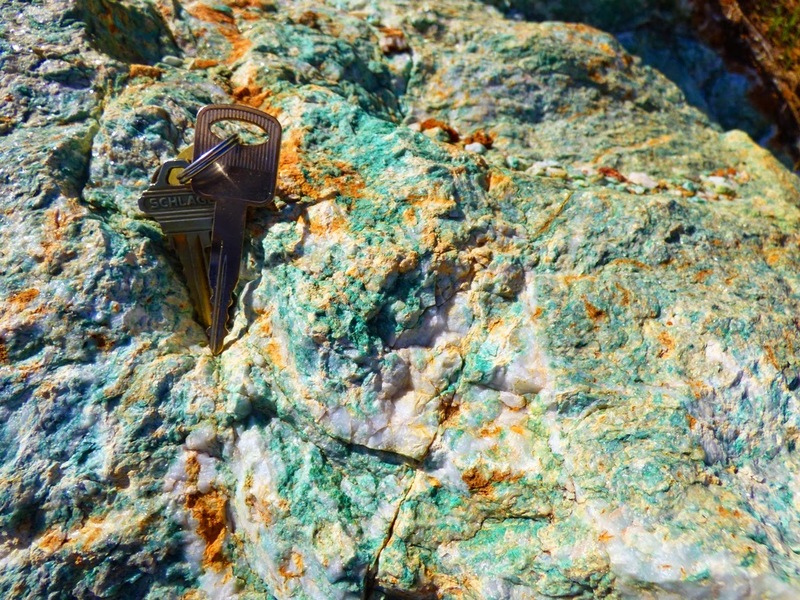 The mariposite is an exceedingly rare mineral elsewhere in the world, but is found at many sites along the Melones fault. It is a chrome mica mineral formed when serpentine rock was altered by hot fluids moving up through the fault system. It was a good indicator of possible gold mineralization. So, I'm wondering what your candidates are for the most significant geological roadcuts in California? I've reviewed the Charlie Brown outcrop, and the Big Pumice Cut that was critical to understanding the age relationships between the glacial tills and volcanic deposits in the eastern Sierra Nevada. I imagine the spectacular folded beds adjacent to the San Andreas fault along Highway 14 in Palmdale might be included. What others would you suggest? There's that one on 299 in the eastern part that's a cinder cone cut in half! Thinking... but Caltrans sure doesn't like having bare rock (Ew!!) showing on its highways in southern California. There's an exposure of the dike swarm in the Smartville complex, but I'm not sure of it's exact location or current condition. The Caldecott Tunnel road cut (Hwy 24) in the Orinda/Moraga formations. Trying to think of a SoCal/LA area one. I'm settling on this one: a roadcut of the Monterey Formation in Griffith Park, Los Angeles, along Crystal Springs Drive, near the Griffith Park NB exit on I-5. Not so important, but it's a thick section of dipping, but relatively undeformed Monterey that would give someone a good feel for this important California formation; and it's accessible being in a Park that you can easily get to by mass transit as well as your car. Kind of underwhelming, but it's the best I can do right now. Classic Franciscan (chert, greywacke, basalt including some pillows) along Waldo Grade - 101 above Sausalito just north of the GG Bridge. Good views in Google Street View from the southbound side. You don't want to stop here though! More classic Franciscan on O'Shaughnessy Blvd. in San Francisco. See chert etc. at https://www.google.com/maps/@37.739766,-122.442891,3a,75y,203.73h,95.44t/data=!3m4!1e1!3m2!1saoRKLMnr0Y4vK2hcvEkK8g!2e0. Glen Park in the canyon below has some great outcrops (distantly viewable in Google). And you can ride a bus right by this (and the Marin stuff) so you don't need to be driving. Good foothill rocks and some asbestos here on Green Valley Road between Cameron Park and Placerville. My favorite road cut, for drama if not the rocks (and they're good), is on Hwy 180 between Grant Grove and Cedar Grove, just west of the final drop (eastbound) to the canyon bottom at Boyden Cave (which is also worth a visit!). It's kind of chewed into a cliff, with the rocks somewhat overhanging the road - at least is looks that way from a small car. Slow down, pay attention (no shoulders), and let the passenger(s) admire the closeups of the rocks. Lobitos Creek Rd has a really cool one - fossilized clams, mussels, etc. embedded in the wall. Couldn't seem to get accurate coordinates but this is pretty close: 37.3930828,-122.3914619. On the right as you climb uphill after crossing bridge. Dangerous road, tho, with bicyclists descending fast. Very good pullout so you can park and go look at the road cut. Don't remove anything, please. All kinds of sea critters in the rock.